Centrifugation has been proven to be one of the most effective methods of separating fluids to maintain cleanliness, recover valuable products, and clarify fluids across many different industries. Trucent provides a wide variety of centrifugal separators that have been designed for liquid-liquid, liquid-solid, and liquid-liquid-solid separation. Combining this technology with over 20 years of separation experience, Trucent has become an expert in both the technical and the service aspects of centrifugation. Separation is dictated by Stokes’ Law, which states that the rising velocity of a particle is a function of gravity, particle size, the density of the particle, and the viscosity and density of the fluid it is in. A centrifuge is used to speed up this process and take control over separation time and accuracy. It does this is by spinning the material at speeds that generate a force thousands of times greater than that of gravity. This rotational speed, coupled with a mechanically sound design, enables you to impact different variables within Stokes’ Law. Trucent’s purification modules separate the water phase, oil phase and solids (i.e., 3-phase separation). 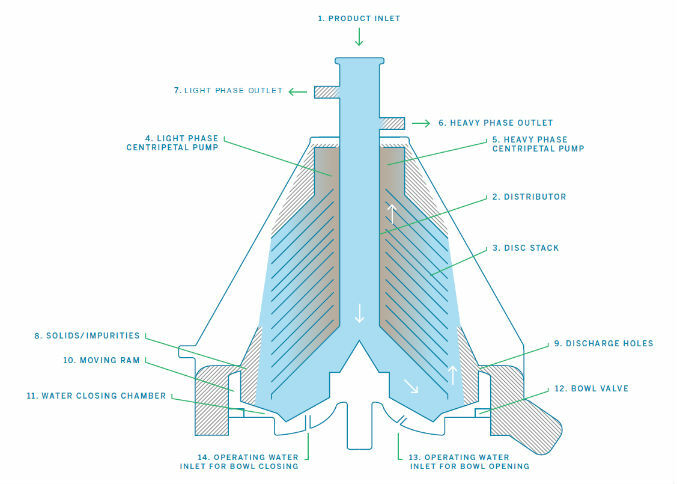 The separation takes place in the bowl of the separator, which rotates at high speeds. As the diagram below shows, the product flows into the bowl through a feed pipe (1) and into the distributor (2) undergoing acceleration until it reaches the bowl rotating speed. The distributor (2) conveys the product to the disc stack (3) where the separation takes place. Discs divide the internal space of the bowl into many thin layers, dramatically increasing the unit’s separation eﬃciency. In water-based coolant applications, the light phase, or tramp oil, flows toward the center of the bowl and leaves the disc assembly via its inner edge. The clean coolant, or heavy phase, flows toward the bowl periphery. The two liquid phases exit the bowl from separate points. Here, two centripetal pumps (4,5) convey each phase separately under pressure to its respective outlet port (6-7). Simultaneously, the solid impurities (9) collect on the underside of the discs. They are continually forced to the periphery of the bowl (8) where they are periodically discharged automatically through the discharge holes. The discharged solids are collected into an outer annular chamber connected to a damping sludge tank where they are drained away by gravity through a pipe. Centrifuges are used by Trucent in a wide variety of industries, including Metalworking, Steel and Aluminum, Utilities, Glass Grinding, Biotech and Pharmaceuticals, and Food and Beverage.